Modern reproductive technologies can give older women the same chances of having a baby as younger women, researchers reported Wednesday. The new study found that women age 31 and younger have about a 60 percent to 75 percent chance of having a baby after three IVF cycles. The chances drop to about 20 percent to 30 percent for women ages 41 or 42, and to about just 5 percent to 10 percent for those age 43 or older. But that's for women who are trying to get pregnant using their own eggs. The chances improve dramatically for a woman over 40 if she switches to using eggs donated by a younger woman, the researchers found. That essentially gives them the same chances they would have had in their 20s. "It is good news," said Barbara Luke of Michigan State University, which led the study being published in The New England Journal of Medicine. "Older women could actually achieve live birth rates equivalent to that of younger women — anywhere from 60 to 80 percent after about three cycles." The study involved nearly 250,000 women who underwent more than 470,000 attempts to get pregnant using in-vitro fertilization (IVF). Researchers found that infertile women who try IVF at least three times have chances of success that are equivalent to those of fertile women of the same age trying to conceive naturally. "This study allows us to take women by age groups and answer the question, 'Doctor, will I ever have a child?' " said William Gibbons of the Baylor College of Medicine, who helped conduct the research. 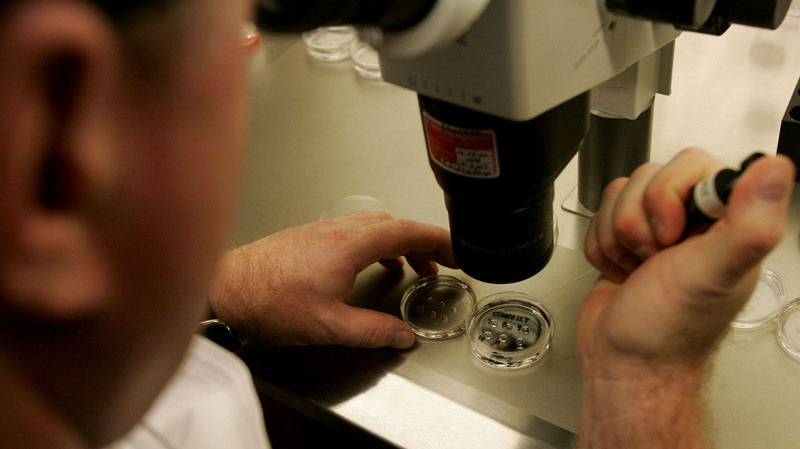 Previously, IVF success rates were calculated based on each individual attempt, or cycle. But that didn't give women a realistic assessment of their chances because many women try multiple times. IVF involves doctors creating an embryo in the laboratory and then placing it into a woman's womb. As more and more women delay childbearing to focus on school and work, women increasingly have been turning to IVF to get pregnant when they are older. But some critics caution that IVF doesn't solve the major factors driving many women to seek help for infertility. First of all, there are lots of people who have moral objections to the whole idea of creating life in a test tube — a lot of embryos are destroyed in the process. And aside from that, many worry about perpetuating the misconception that IVF can truly reverse the biological clock. "Technology hasn't solved the biological clock," said Rosanna Hertz, a sociologist at Wellesley College. "For older women, they still are subject to their clock ticking." IVF is expensive and unpleasant; the hormones women have to take can be risky. In addition, a woman who uses eggs from a donor is not genetically related to her child. "There is a sense of loss that she can't conceive a child who is genetically related to her and that they won't share necessarily the same traits or talents or whatever," Hertz said. There may be implications for the babies, too. Hertz is studying children born from donated eggs. These children seem to have some of the same issues as adopted children, she said. They "actually think about donors as live people," she said. "So that you're introducing another person into the family, so to speak, who may live in the shadows of family life but nonetheless is very real for the child." Hertz is among those who say the real solution is for society to make it easier for women to have children when they are younger. "It's really hard to have any kind of a serious professional life and have your children in your early 20s, when you're body is best for it [and] it's easy to get pregnant," said Barbara Katz Rothman of the City University of New York. Far fewer women would need IVF, she says, if society took steps to make it easier for women to have babies when they are younger, such as making day care more affordable and paid maternity leave longer.